A new report by leading Internet analysts SimilarWeb has shown that search engines can drive up to ten times more traffic to ecommerce sites than social media. This trend is seen on both mobile and desktop websites and demonstrates that SEO is still the most important digital marketing strategy for new business websites. The Global Marketing Report 2016 was written by Joel Zand and Pascal Cohen, SimilarWeb’s Digital Insights Manager and Marketing Analyst. The report available for download from their website. It is clear that search traffic exceeds all other traffic sources by a considerable margin. The report divides referrals into six groups: Direct, Mail, Referrals, Search, Social and Display Ads. Direct traffic is when a person visits a website without searching or clicking on a link – usually either typing the address directly into the browser or using a bookmark. Mail refers to visits via an email newsletter. 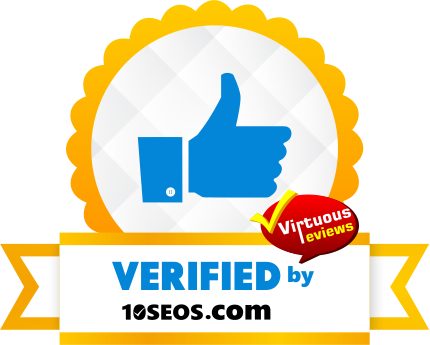 Referrals are visits from other websites, such as links in news articles, reviews and forums. Search is specifically organic search referrals (i.e. not AdWords in search). Social refers to all social media websites, and can include both organic sharing and social media advertising. Finally, Display Ads refers to banners, which may mostly be via AdWords, although this may include direct advertising and affiliate ads too. 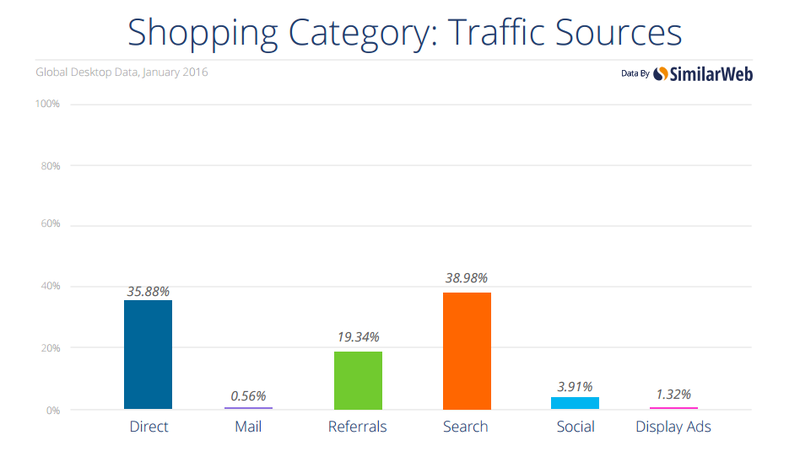 As you can see from this table, Search, Direct and Referrals account for most traffic to shopping websites. Mail and Display Ads account for a very small amount of traffic. We would have thought that Display Ads would be a huge driver of traffic, but it is likely that increasing costs of advertising means that many businesses simply cannot compete and so have adopted a strategy that combines SEO, direct advertising and referrals. Overall, from Google, Display Ads accounts for 1.32% of traffic and Paid Search 1.97% – this means that paid advertising is only sending 3.29% of traffic to shopping sites from Google’s search engine. Mail throws up another interesting result – however, this does make sense. People rarely buy products based on an email alone. What the report is unable to say is whether the direct visitors are also mail subscribers – many people will see an offer in an email and then visit a website days or weeks later to make a purchase. The report also does not differentiate between brand keyword searches and product keyword searches. A bulk of the shopping searches could be as a result of people searching for “Amazon” or “Argos”, rather than searching for a product. This says more about how people use Google to find websites than it says about marketing trends – in the past people would bookmark their favourite websites, nowadays, people rely on brand searches in Google. Some niches perform even stronger in search. 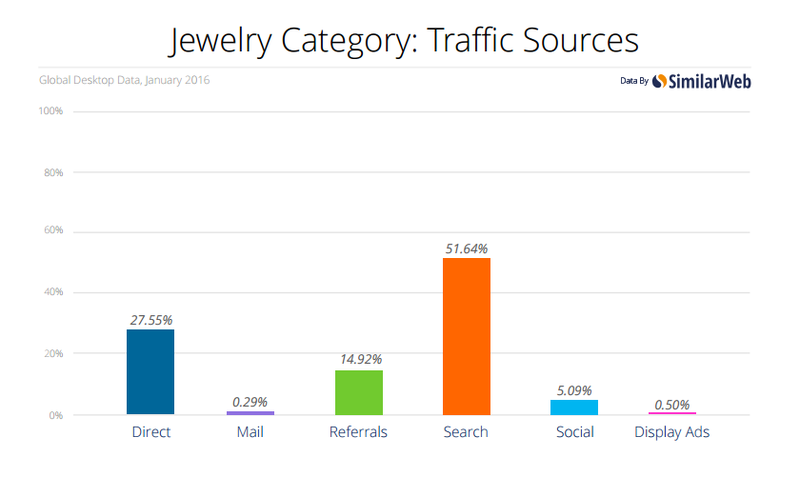 For example, jewellery shops received around 51.64% of traffic from search. What is most striking is that a vast majority of searches are for brands, with Pandora, Rolex, Swarovski, Fossil and Tiffany leading the pack – people do not appear to be searching for “jewelry shops” (American spelling) – this makes a lot of sense really, as people shopping for jewellery online will already have a very good idea of what they wish to buy. Paid search accounts for around 6% of search traffic, and organic search the remaining 96%. Again, SEO is a major factor at play. Of course, it is important to note that social media is still important – SEO may be the dominant factor in winning new customers online, but you should not ignore the fact that between 3 and 10% of all digital leads may be coming from Facebook, Twitter, LinkedIn and other social media websites. Ignoring social media may save a little time, but you will lose out on a significant part of the market. Similarly, mail and display advertising are also important. The report only shows the amount of traffic being delivered to websites, it does not provide any insights into conversions. It may be that search traffic is converting at a much lower rate than display advertising, and email may help to bring back past customers and help promote deals which would otherwise have gone unnoticed. It is important to utilise every digital marketing channel in your marketing campaigns. While is search is delivering the lion’s share of traffic to shopping sites, the other channels are responsible for the remaining 62%, so ensure that your strategy includes all channels. Contact Freelance SEO today to learn how we can help improve your digital marketing strategy.